Be the first to share your favorite memory, photo or story of Alice. This memorial page is dedicated for family, friends and future generations to celebrate the life of their loved one. 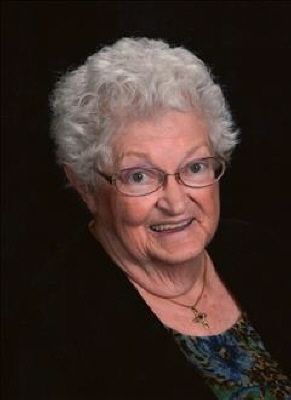 Alice Evelyn McCauley, age 87, wife of Earl S. McCauley, of Altus, Oklahoma and formerly of Cheyenne, Wyoming, passed away Monday, January 14, 2019 at the United Regional Health System in Wichita Falls, Texas. Alice was born on November 24, 1931, on a wheat farm north of Otis, Colorado, to her parents Harry (Lloyd) McFall and Elsie Mabel (Day) McFall. She grew up primarily in Kansas, and after graduating high school in Pratt, Kansas, attended Pueblo Junior College, then Southwestern College in Winfield, Kansas, studying music. Education was very important to Alice. She continued her education at Friends University and Wichita State University, studying History and Education. She did substitute teaching in in the Haysville (Kansas) School District, held many positions through the years. Yet later, Alice attended Laramie County Community College and retired in 1992 from working for the State of Wyoming in order to continue working toward her Fine Arts degree in vocal music from the University of Wyoming. Throughout the years, Alice took great joy in music, both performing and listening. She was a lifelong Methodist and active in her church womens' organizations, taught Sunday School, and Stephen Ministries. Alice was a vocalist, organist and choir director wherever she lived. Alice was a member of Oak Leaf #6 Order of Eastern Star in Cheyenne, WY; Altus Chapter #49 in Altus, OK, Great Plains #3, White Shrine of Jerusalem in Cheyenne, WY; and SMART Club of Oklahoma. She was a Past Matron and Past Grand Representative of Ontario in Wyoming. Alice served her community as an election worker, volunteer for various charitable organizations and businesses. She was also a needle worker, seamstress, painter, writer, and a reader of anything in print. She had a life-long drive to continue to learn about her world and its people. Alice enjoyed being a homemaker and staying involved in civic duties, but most of all she was dedicated to keeping in touch with her family and friends. She treasured time spent with her loved ones. Alice was preceded in death by her parents; an infant sibling, Helen Grace McFall; brother Reverend William "Bill" McFall and wife Ramona Hauser McFall, brother Robert "Bob" McFall. Alice survived two children: Dorene Laverna Petty's sudden death, Joyce Lynn (McCauley) Welch and spouse Andrew, along with their children Maddison Grace Welch and Samuel Welch in an automobile accident. Alice is survived by her husband, Earl S. McCauley, Sr. of the home; seven children: Howard Carroll Petty and wife Kristi of Illinois, Evelyn Diane Petty and husband John Aldis of Colorado, Susan Lorraine Petty, James "Lloyd" Petty and wife Cindy of Wyoming, Winona "Noni" Karen Petty and husband Andrew "Andy" Bacon of Colorado, Matthew Petty of Oklahoma, Lorena McCauley Orman of Jonesboro, Arkansas, and Earl Samuel McCauley II and wife Yuka of California; brother Keith J. McFall and wife Rhoda of Kansas, Sister Ruth L. Meuser of Oklahoma; 18 grandchildren, 9 great-grandchildren and numerous other family and friends. Memorial Services will be at 10:00 A.M. on Monday, Feb 11, 2019, at the First United Methodist Church in Altus with Pastor Jane Vaughn officiating. Ashes laid to rest in Cheyenne, Wyoming. Cremation and arrangements at Lowell-Tims Funeral Home in Altus, Oklahoma. To send flowers or a remembrance gift to the family of Alice McCauley, please visit our Tribute Store. "Email Address" would like to share the life celebration of Alice McCauley. Click on the "link" to go to share a favorite memory or leave a condolence message for the family.